Each year, the Copenhagen fashion scene awaits the Henrik Vibskov show with great anticipation. It’s not just about the clothes; it’s the complete mis-en-scene that make Vibskov’s shows unique. After all, Vibskov isn’t just a fashion designer but also an artist, interior designer, film director and musician – a real Renaissance man. This year, the show was at Copenhagen Town Hall, which Vibskov successfully transformed into a performance space to showcase his latest offerings. The models paraded around dancers camouflaged in an organic black web of material. As we’ve come to expect, Vibskov’s pieces continue to blur the boundaries between fashion and art. 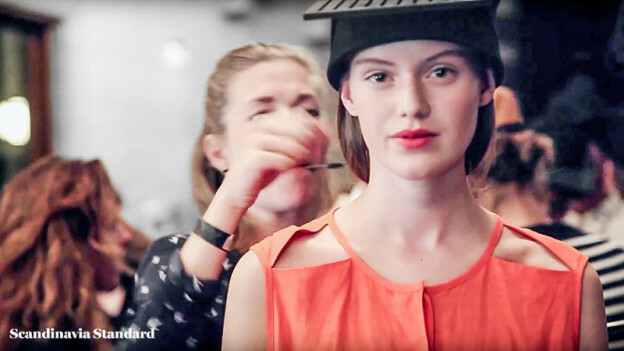 While the runway gets a lot of media attention, it’s backstage where all the magic happens. Thank you to Ufornia for the their track ‘Boredom’s the Dynamite’ from their latest EP. August 10, 2015 by Freya August McOmish.